Add a waterfall to your garden without the setup of pond installation using the Little Giant Simply Falls Waterfall Pump Vault. This vault is ideal for areas in which you desire a waterfall but a standing body of water is either unsafe or unwanted. This unit houses your submersible pump while shielding it from dirt and rocks, allowing the pump to stay submerged yet protected. The horizontal slats throughout the vault allow water to enter and keep the pump submerged but prevent debris from clogging the pump. The vault rests in an excavated hole which can be filled with water and gravel to create the appearance of solid ground. The 3" diameter hole allows tubing to run from the pump to the top of the waterfall without altering the unit. 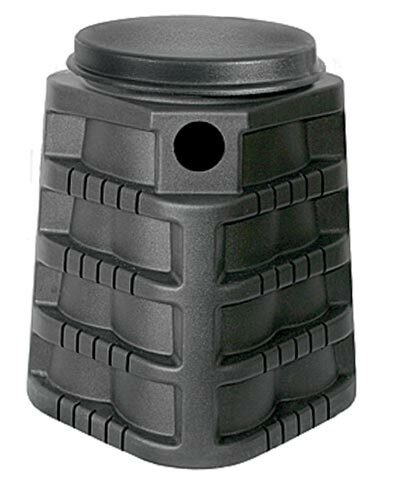 This vault's innovative design accommodates horizontal or vertical pumps, and the sturdy polyethylene construction will last for many seasons. Add a waterfall to your garden without creating a pond using the Simply Falls Waterfall Pump Vault. One year limited warranty.